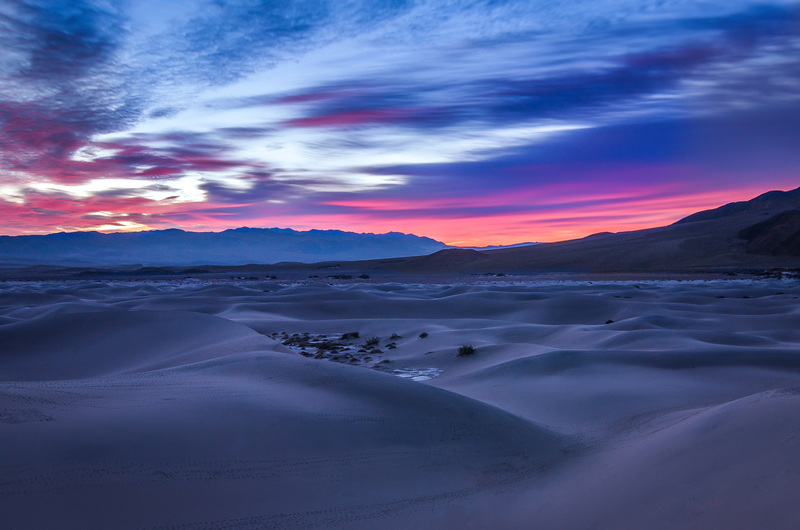 With a surface area of over 5,000 square miles and an elevation ranging from 280 feet below sea level to over 11,000 feet, there’s a lot to see in Death Valley National Park, located along the California and Nevada border. 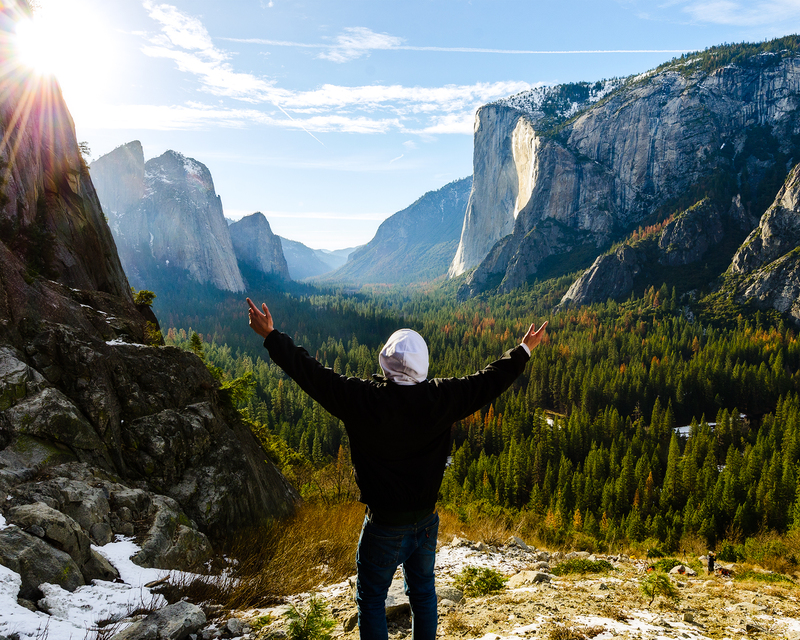 But if you only had four days to visit this unique and diverse national park, how would you be able to see and enjoy some of its most famous locations in such a small amount of time? Last December, my father and I attempted to do just that. 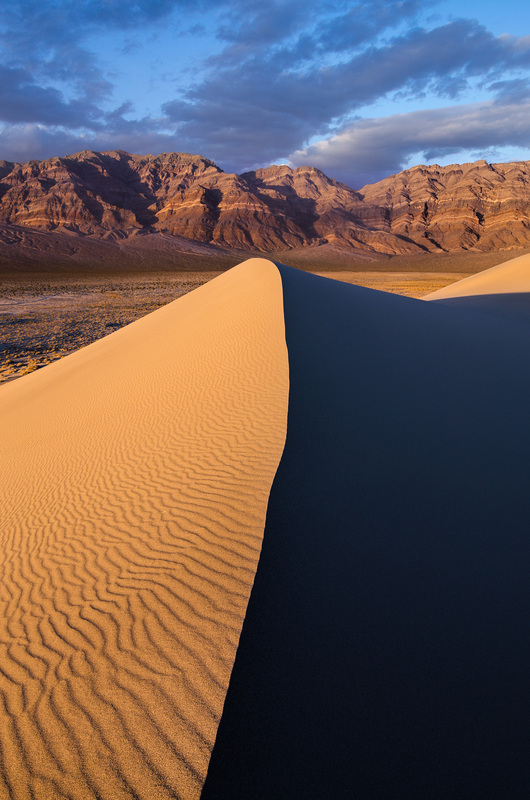 We were able to experience some of Death Valley’s most fascinating attractions and although it might have been impossible to cover the entirety of the park in such a small window of time, it left enough interest to come back and explore more. 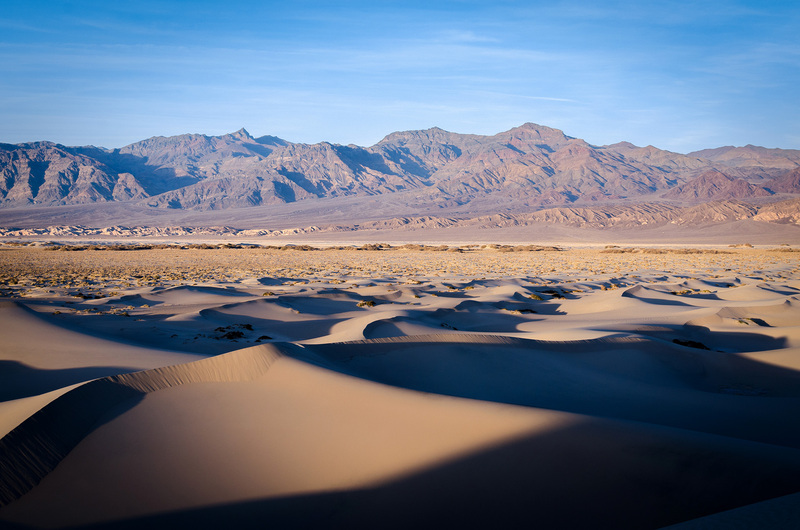 The Mesquite Flat Sand Dunes are one of Death Valley’s most popular attractions and, compared to the park’s other dunes, are the easiest to access . When I arrived, they were bustling with tourists and I got a sinking feeling that I wouldn’t be able to get any of the shots I had envisioned without footprints intruding on my compositions. However, my dad and I had just driven 8 hours that day in order to see this place, so I was not ready to give up that easily. Most of the people there only went about a half mile into the dunes, so in order to find dunes free of humans, we had to walk further than most would go. After hiking for what seemed like ages, we stumbled across a pristine area and happily began snapping away. One of my favorite shots I got from the trip required me to lay down in the sand in order to get a good perspective of the dune I was shooting. 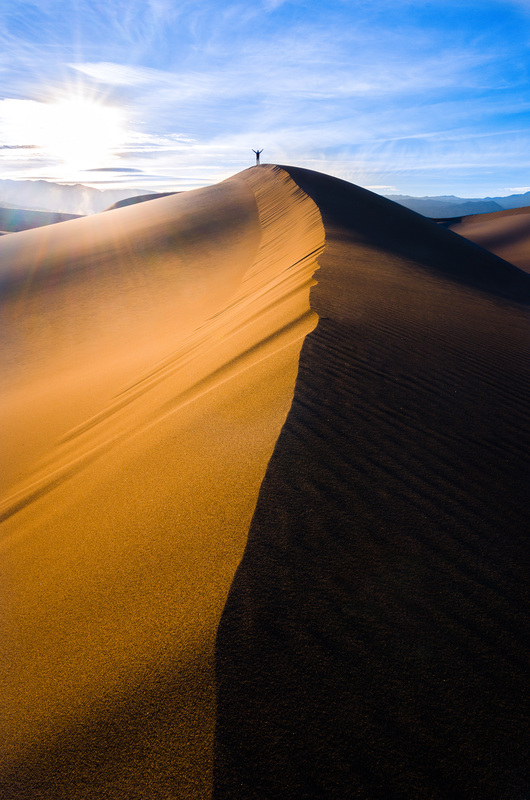 There are endless opportunities for one to come up with unique compositions in the Mesquite Dunes, so don’t be afraid to go a little outside of your comfort zone and get creative with it. It was hard waking up at the crack of dawn after a long night of shooting, but as I looked up into the morning sky, my sleepiness instantly evaporated as I saw a deep red glow slowly spread across the sky. Sometimes giving up a little sleep is worth it. The legendary Racetrack Playa: A dried lakebed that holds an ancient on-going race between various sized rocks – some weighing over 100 pounds! 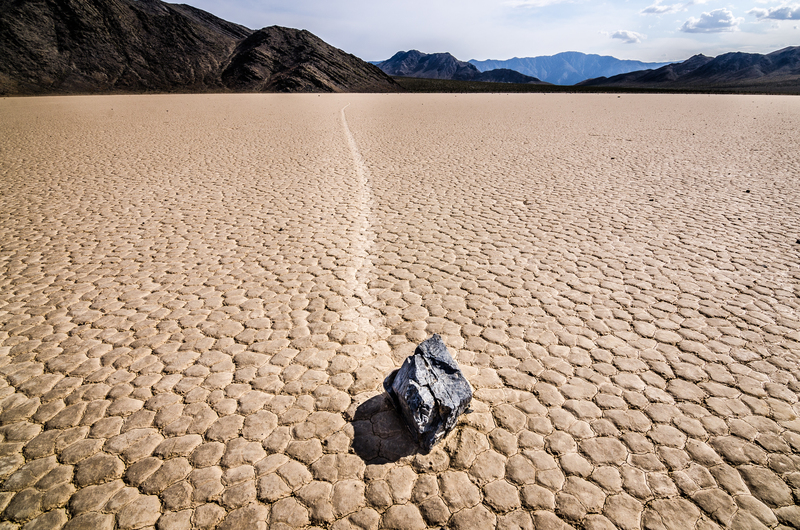 The science behind how these “sailing stones” move was a mystery up until 2013. A whole heck of a lot has to come together in order to get these rocks to move. Researchers discovered that when the lakebed is covered in a few inches of rain and freezes over, the rocks are then embedded in ice deposits. If winds are strong enough, the rocks are pushed across the thin layer of water trapped underneath the ice, leaving a trail of mud behind. Our journey to the Racetrack was an adventure all in itself. 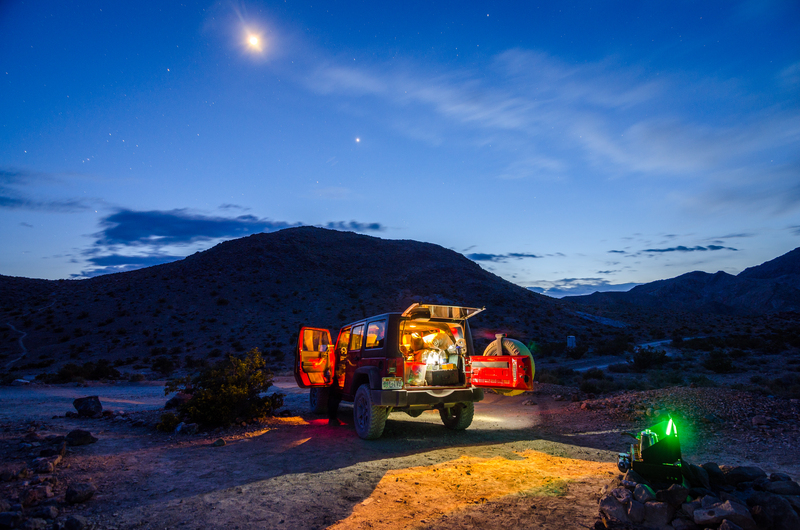 It consisted of twenty-six miles of 4×4 off roading, almost no cell reception, thousands of Joshua trees, and fifty teakettles. Teakettles? That’s right. One of the most bizarre things I’ve seen on this trek was a crossroad with the sign “Teakettle Junction” in the middle of it. Over the years, visitors have hung their teakettles on the sign with messages or memoirs written on them regarding their trip to the Racetrack. After hours of bumps and bruises in the car, we finally caught sight of the playa as it shimmered in the sun’s heat. It was completely flat except for two large, dark rock formations known as The Grandstand. Shooting up 75 feet into the air, it offers a great view of the whole playa. About two miles down the road from The Grandstand, my dad and I saw the first few rocks. I couldn’t believe how far some of them had moved. Some have been measured to move as much as 1500 feet! My eyes followed their trails until they slowly merged into the horizon and disappeared from view. Another two miles down the road was a surprisingly well-maintained campsite with old mine shafts dispersed across the surrounding mountain sides. During the California gold rush in 1848, mining was popular in many parts of the park. If you look carefully around the campsite, you can still find old, rusty cans and mining equipment left behind by the miners. 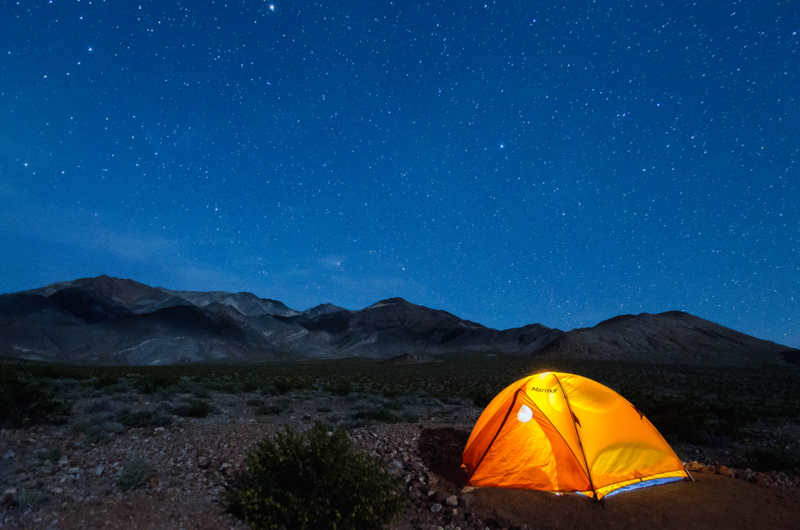 Nothing beats the feeling of crawling into your tent after a long day of shooting and falling asleep to the silence of the outdoors…. And then waking up two hours later to begin another day of shooting. 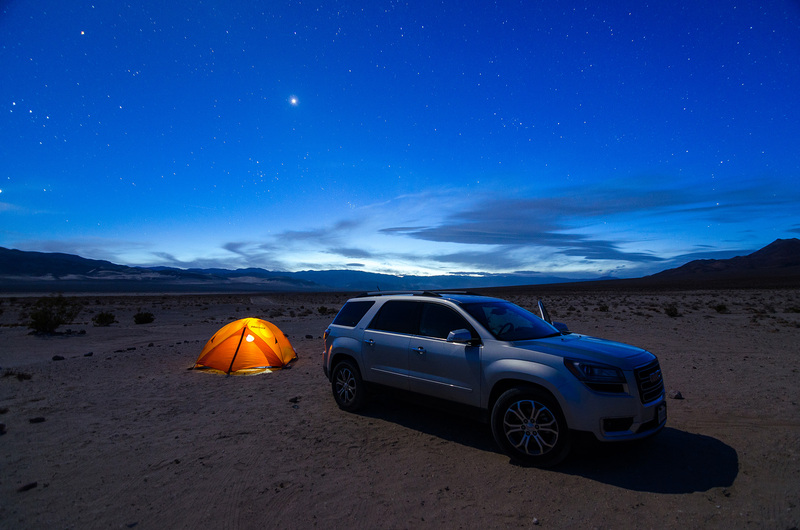 After a fast night at the campground, it was off to explore a new part of the park – Zabriskie Point. 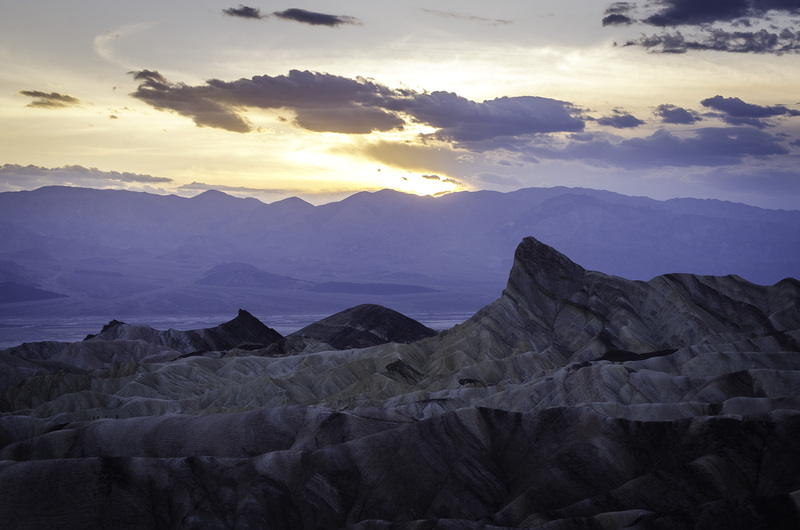 Visiting Zabriskie point is like being on another planet. The alien landscape consists of mud hills and gullies that exhibit shades of red, orange, yellow, and purple when the afternoon light hits them right – a perfect place for a photographer to get creative. The area is a great place for hikers as well and I saw many people trekking over the mudstone. Unfortunately, I wasn’t able to explore Zabriskie Point as much as I had wanted because most of the day was taken up from driving back from the Racetrack. However, I was lucky enough to get a couple decent shots before the sun went down and I look forward to exploring more of this spot on my next trip to the park. 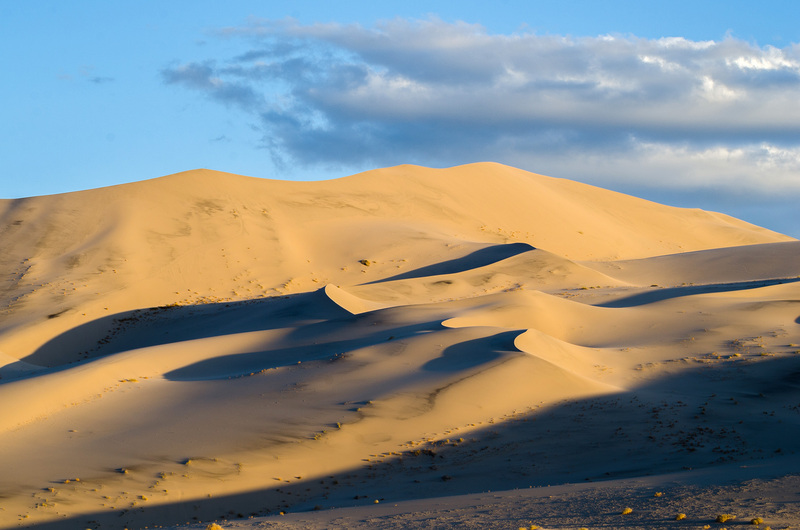 With over 700 feet in height, the Eureka Sand Dunes tower over its surrounding desert landscape. 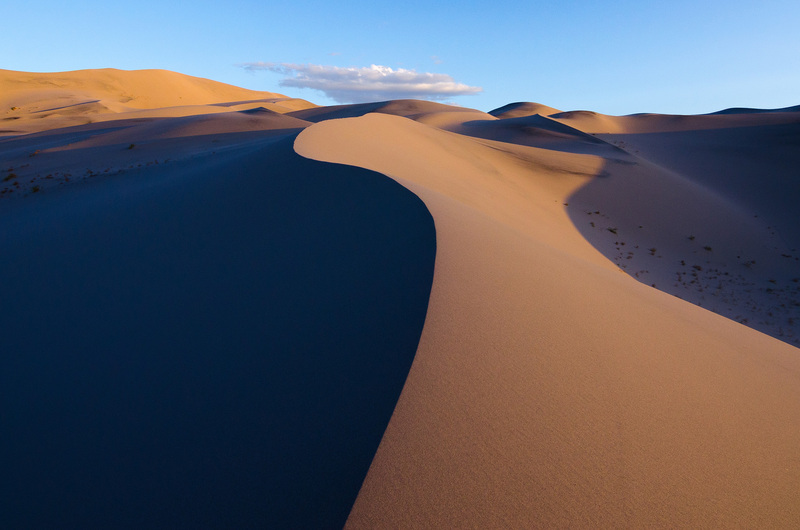 They are only three miles long and one mile wide, but are some of the tallest sand dunes in North America. The dunes are considered to be an oasis for many different plants and animals. They are so unique in fact, that they sustain five species of beetles and three species of plants that aren’t found anywhere else in the world! 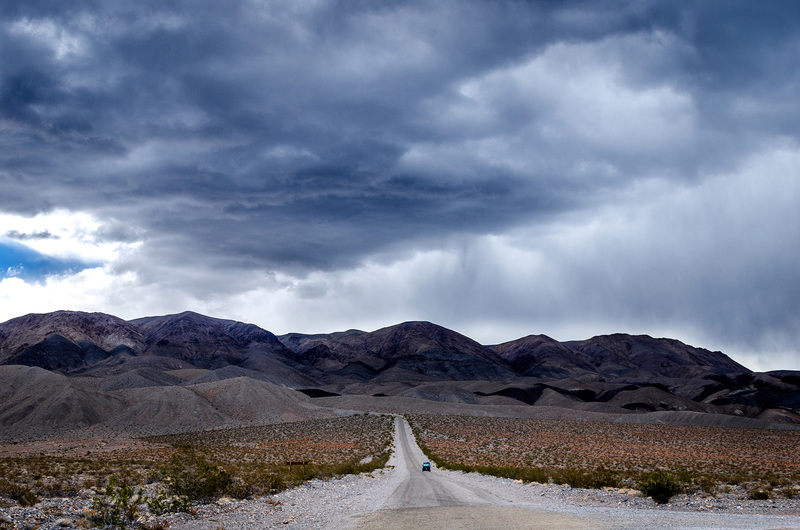 Like many other places in Death Valley, the backcountry roads are poorly maintained and full of treacherous rocks. But unfortunately, this particular road – a 10 mile stretch of unpaved madness leading straight to the dunes – is notorious for causing flat tires. We tried our best to drive as cautiously as we could while making our way to our destination. After what seemed like an eternity, we safely made it to a campsite at the base of the dunes. But as we were unpacking our gear, one corner of the car was sneakily getting lower to the ground. A flat tire was the last thing we needed since sunset was just a few hours away. We both wanted to catch the last light of the day in this new location, so we quickly got to work. Once we had finished tightening the last bolt on the wheel, there were only minutes of light left in the day. I scrambled up some of the closer dunes to scope out some good compositions. Thankfully, I was able to line up a few solid shots before the sun set behind the surrounding mountain tops. 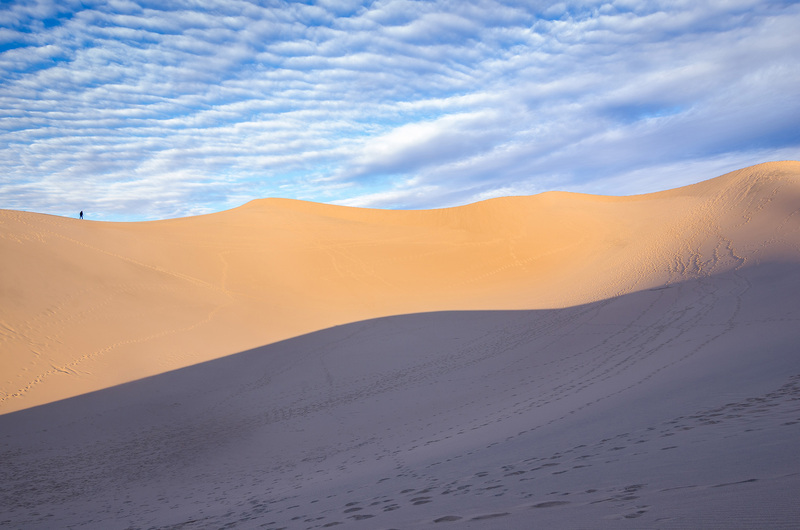 After an almost completely overcast day, the clouds managed to break up just before sunset and the dunes literally glowed with the last light of the day. Last Chance Mountain Range lies east of Eureka Sand Dunes and has some of the craziest textures and lines I have ever seen in nature. The range is made up of rock that has been around for 2.5 million years. About 15 minutes before sunset, each layer of rock was exaggerated as the fading light illuminated the million year-old rock face. The lines of sediment popped and exploded with color as the sun slowly slipped below the horizon. After scrambling up the nearest dune in order to catch the scene, I sat down in the sand and thought about how insignificant and short our lives were compared to all that was around me. I was currently 1/600000 the age of the rocks in front of me and it made me realize how little time we have to live our lives. It made me want to experience more, see more, and explore more before my time on this planet is up. The dust you see in this photo was kicked up from high desert winds. 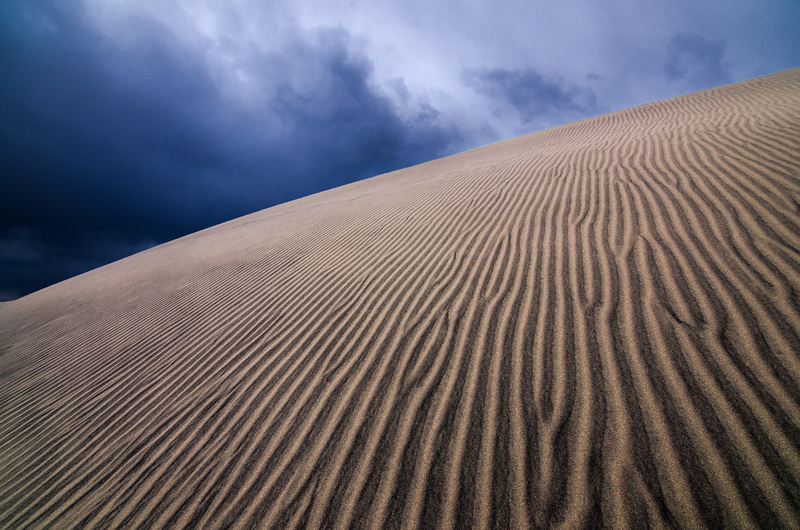 The wind at Eureka Dunes was both a blessing and a curse because although it quickly cleaned up stray footprints left in the dunes, it caused sand to get in my hair, ears, and other fun places while making it nearly impossible to change lenses. However, it is in environments like these where some of my favorite shots come from. However, the day was far from over. 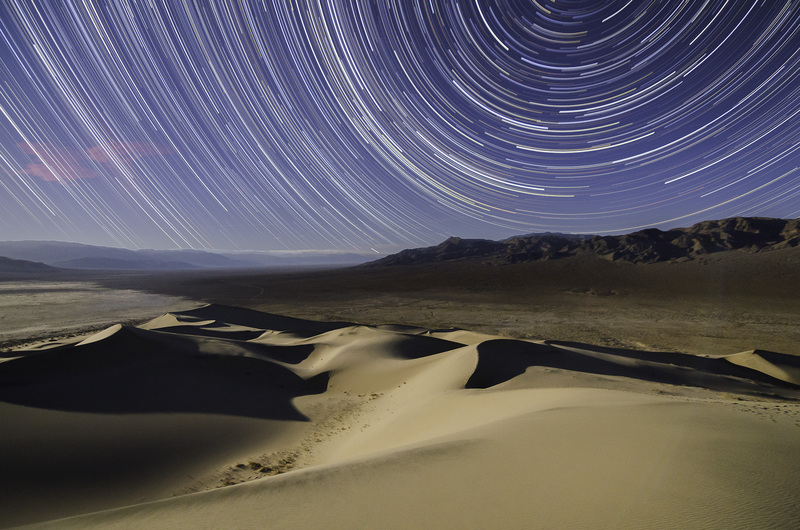 I had an idea of a shot that I wanted to get ever since I first learned of Eureka Dunes. After gulping down a quick dinner, my dad and I set out on an hour and a half trek to the top of the sand dunes. 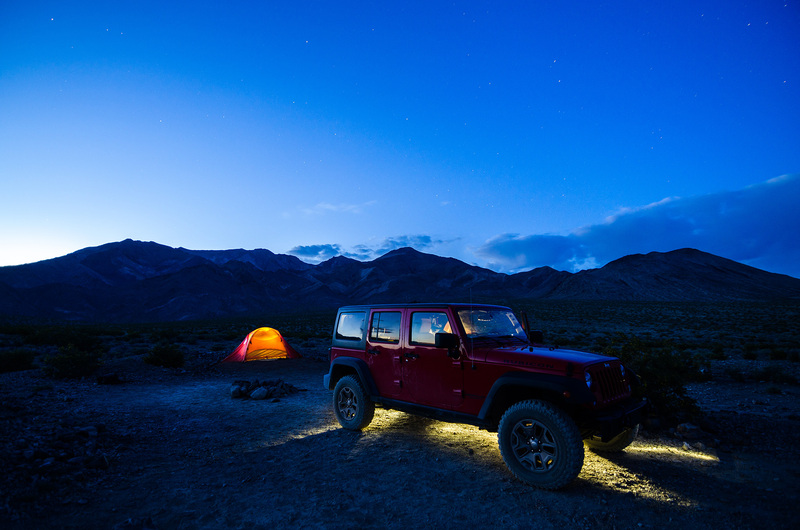 The sun was long gone by then, and we only had the moonlight and our headlamps to guide us. The hike was absolutely grueling. For every three steps we took forward it was one step backward as the combination of loose sand and steep slopes provided us with very little friction to work with as we were walking. The dunes also had no distinct landmarks or textures that I could see. Everything in front of me was just a pale blur under the moonlight and I was becoming more and more disoriented. Eventually, we reached a flat spot near the top of the dunes. It wasn’t until I turned around that I discovered where I was. My jaw dropped as I looked at the scene in front of me. The shot I had envisioned had materialized right before me. The whole valley was bathed in soft yellow moonlight as the dune’s shadows grew longer and longer with the setting moon. The beauty of what I was seeing made me grateful to my dad for making this trip possible and helped me realize that all the time and effort we put into this trip was worth it. 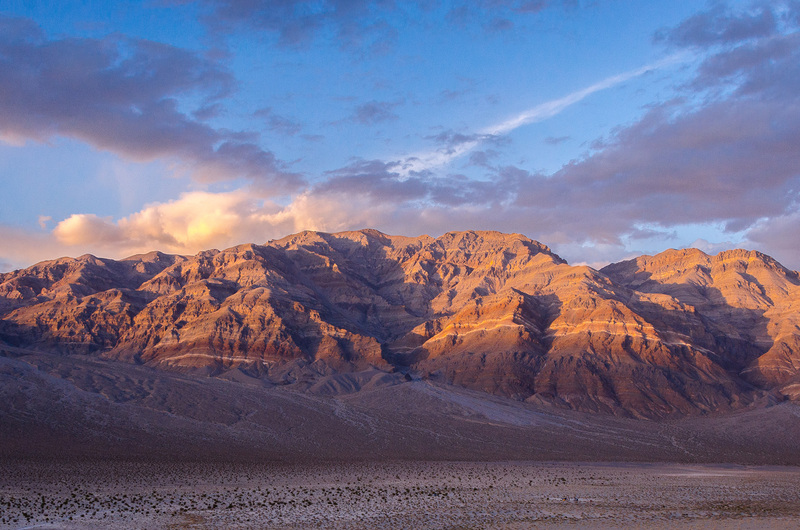 I learned a few things during those four days in Death Valley. For starters, although I was able to see many different interesting parts of the park, I almost felt cheated of my time with these unique locations. When I look back on it, everything sort of blurred together in those few short days. The next time I go back, I plan to spend at least two days at each place so I can experience them to their fullest. 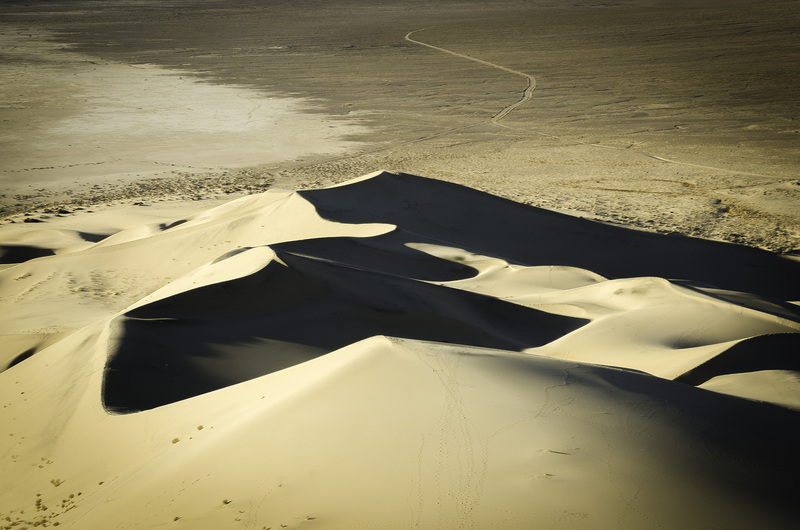 I also learned that the desert can be very hard on your photography equipment. 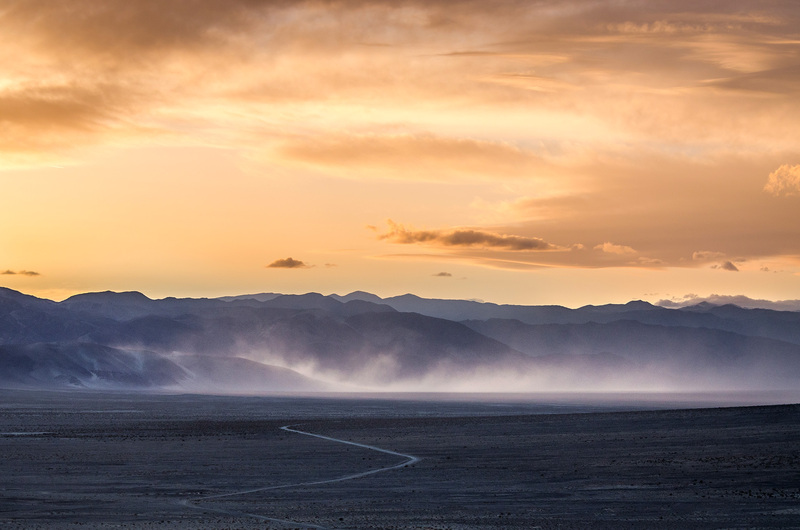 It can be really windy in Death Valley, which means dust and dirt can easily infiltrate your camera body and lens. This can cause dark spots to appear on your final images. To prevent this from happening, avoid changing lenses as much as possible in the open air and if you really must, make sure that you do so in a fairly clean environment. For example, in your car or tent. This will help you to prevent having to spend extra time removing annoying spots in your photos. 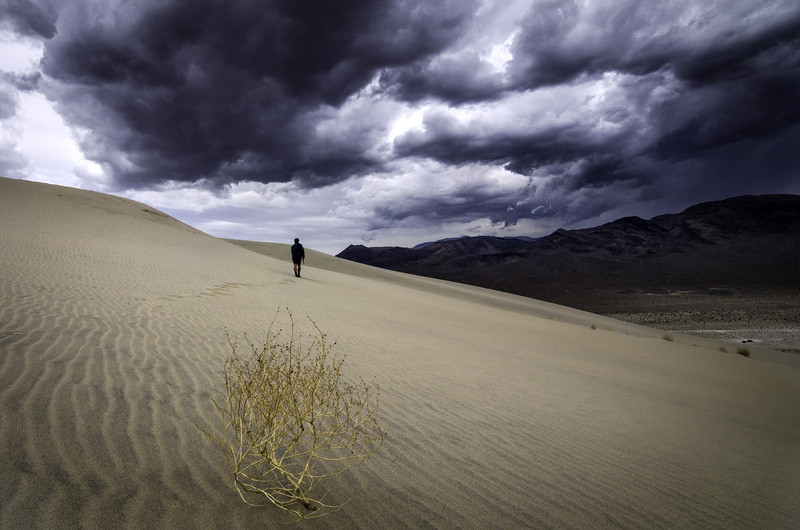 But the biggest takeaway is that I really enjoyed exploring Death Valley during the time I had. It made me realize how special and beautiful the desert landscape truly is and how lucky I am to practically have this place in my backyard. I can’t wait to go back. To see more from Taylor Gray, follow him on Instagram at @taylorgrayphoto or on his website.